Several years ago (March, 2009, to be exact), I started thinking and writing about the connections between TBI and PTSD. I had it a lot of it figured out in my head, and I was going to write a great deal about it. But then I changed jobs, and everything kind of went to pot in the TBI-PTSD writing department. I did write something about PTSD/TBI Factor #1 – Proximity to a traumatic event, and I had all the others ones queued up in the back of my mind to write about. But I guess my distractability got the best of me, and I ended up heading down other paths of inquiry and extrapolation. Now with the recent research at UCLA about the link between traumatic brain injury, post-traumatic stress disorder, even more attention is being brought to this (and let’s hope more funding follows). This kind of research is tremendously critical for TBI survivors, their spouses/friends/co-workers/employers, and society as a whole, for it adds a much-needed component to the considerations — namely, how TBI can totally screw you up in some unexpected ways. After all, you just hit your head, right? What’s all the excitement about? And why aren’t you getting any better…? It’s a mighty strange thing, that we are at a juncture where we actually have to justify expanded research into these areas. Our society claims to be vexed over homelessness and crime rates – which also have a correlation with traumatic brain injury – rate of TBI is 7 times as great in prison populations as in society in general, and yet we are so cavalier about TBI (which also includes concussion) and PTSD. a significantly higher number of homeless participants (48%) reported a history of traumatic brain injury than control participants (21%). Of those homeless participants, 90% indicated they had sustained their first traumatic brain injury before they were homeless. So, why are we even having these discussions right now? Why hasn’t it been federally mandated that concussion, traumatic brain injury (and for that matter PTSD) be addressed at the level that space travel was mandated in the 1960’s? If we can get to the moon because our leadership decided we would (some would dispute that we ever got to the moon, but that’s another discussion for another time), why can’t we find some uniformity and, well, intelligence, around issues of TBI and PTSD? Personally, I think part of the issue is how we approach the issue. We (in the US and in the West in general) are a highly specialized society with identified experts to whom we delegate the problem-solving tasks of our increasingly complex world. At the same time, we don’t offer uniform support to all our experts, because well, there just isn’t enough money to go around, their product is not uniformly high-quality, and they’ve got to compete for it. What’s more public sentiment may swing in one direction or another — or completely away from the subjects under consideration because they reek of “personal irresponsibility” that contradict our American dream of individuality and requisite self-reliance. For example, if the general population doesn’t believe that traumatic brain injury (especially “mild” TBI) and post-traumatic stress are cause for concern because “it’s all really just a question of willpower and the last thing you should do is coddle someone who’s milking it”, they’re probably not going to pay much attention to the issue and demand that it be solved. When you think about things that way, they become issues of personal determination, and the impulse to help actually turns into an impulse to NOT help. However, if it becomes clear that TBI (and PTSD) are truly medical issues which are tearing away at the fabric of our lives, no matter how hard we try to fix them, and they require additional medical and professional resources to address, then there’s a greater likelihood of the CDC and various funding sources to step up and take on the problems and issues and make the effort to arrive at some plausible approaches. But I digress down the road of public policy and need to get back to connecting trauma and traumatic brain injury. I think that a tremendous amount of excellent work has been done, thanks to leaders like Bessel van der Kolk, Peter Levine, and Belleruth Naparstek. I personally know a number of therapists who specialize in trauma — and there is no shortage of business for them. Our understanding of how trauma impacts individuals in childhood as well as adulthood has expended exponentially over the past 20-30 years, and a lot of suffering has been relieved. At the same time, I do believe that significant areas have been overlooked with regard to major issues like Traumatic Brain Injury, because it doesn’t apparently “fit the profile” for commonly recognized predictors of post-traumatic stress. The predictors which accompany things like motor vehicle accidents, sexual assault, wartime trauma, domestic abuse, violent assault, obvious bodily threat, and your “standard issue” sources of post-traumatic stress disorders, which have been the focus of trauma research for the past 20+ years, simply aren’t the same as they are with (mild) traumatic brain injury. So, even though the word “trauma” is part and parcel of the TBI label, it gets overlooked all the time — and the people who get paid to pay attention to these things, and who make names for themselves studying trauma, just don’t get the degree to which (m)TBI is a chronic, continuous source of post-traumatic stress. Traumatic brain injury — especially Mild traumatic brain injury — is a glaringly obvious precursor to post-traumatic stress experiences and disorder… IF you know where to look. But precious few people seem to be looking in the right places. Everybody wants a “deer in headlights” experience to trace back to. Everybody wants a “clear and presently inescapable danger” happening at one point in time, to pin the stress and disorders on. Everybody’s looking for that one, cataclysmic experience of life-and-death helplessness to help explain the disorders and stresses and dysfunctions that follow trauma. 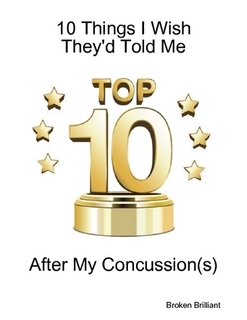 It’s like everybody used to look for the big, significant hits in football to explain the cognitive issues… when all along, it has more likely been the the sub-concussive hits that have added up over time to contribute to cognitive decline and CTE in football players – one as young as 18. What we’re missing, consistently and collectively, is the significance of small hits — the “little” traumas that occur throughout one’s life after TBI — the seemingly minor flubs and foibles that become part and parcel of our everyday experience after brain injury. On the surface, those mis-steps and mis-speakings may not seem terribly impactful, and for someone who is reasonably well-adjusted, they need not be a big deal. But for those of us living with chronic TBI conditions which amplify the impact of even the most minor emotions and reactions, even the little things can turn into big things. It has nothing to do with the objective severity of what happens with us — it is all about our subjective experience of those supposedly minor problems (and trust me, the more minor that you know something is when it’s sending you over the edge, the more stressful it is to deal with). It’s all about the internal neurological and biochemical reactrions that take place inside us, like a series of little explosives going off, one after another, releasing all sorts of stress hormone goodness into our systems, producing increasing levels of stress and decreasing levels of comprehension and acceptance. When it comes to TBI, it’s almost beside the point, what the relative severity of our issues is. ‘Cause when you’re dealing with TBI and you’re already stressed from the myriad little things that go wrong over and over and over again that you have to keep working harder and harder to deal with and overcome, relative, objective severity means nothing. Objectivity has no leg to stand on, because our internal circuitry is being fed a constant stream of messages that we have to go faster, work harder, be better… which plunges us into a tidal pool of stress hormones, day after day, week after week, month after year after decade, until our systems are chock-full of cortisol, adrenaline, epinephrine, and all those other biochemicals that skew our perceptions and actually shrink parts of our brains — the parts that help us remember and learn. The thing that’s particularly traumatizing about this, is that a lot of it happens while we are aware that things should not be going this way. When you’re supposedly “okay” and you find all sorts of aspects of your life going wrong, and you feel helpless to stop it, there is that definite, pronounced sense of being a deer in headlights, or being unable to fully respond to what’s going on in front of you. When you go past the initial traumatic brain injury, and you wade into the morass of the aftermath, that is where the real trauma starts to happen. And it keeps happening. Over and over and over again. And unless you can get some help to 1) realize that things are not going right and you need to get some help, and 2) figure things out so you can come up with alternative ways of managing your life… well, you’re stuck in the path of a Mack truck on a regular basis, and you have no way of predictably getting yourself out of danger. This, I firmly believe, is why the long-term prospects for mild traumatic brain injury tend to be even worse than people with moderate or severe injuries.The changes can be so subtle, so nuanced, that they are invisible to us, and we only start to notice them when things start to go obviously wrong — which can be months, if not years, on down the line after the initial injury. It’s baffling to many, but it’s pretty common-sense to me — over time, we “lay in” new neural pathways that are organized around faulty wiring, and our wiring gets hardened into crappy patterns and chronic confusion. It can take a monumental effort to turn that all around — IF (and this is a huge IF) you can actually find competent help to make the necessary changes. Right now, there’s a vast and gaping void where that need exists — for no reason that I can fathom. Why wouldn’t we as a society, a culture, a nation, throw our full weight behind sorting things out and getting people on a good track, before they can get set in their mistaken ways — and take themselves (and everyone who depends on them) down that dark road that too often leads to oblivion? Why indeed? I think it’s primarily because people just don’t understand. Also, people can be willfully ignorant and mean-spirited. It’s more fun, frankly, to make fun of village idiots, than realize the true nature of their difficulties and step in to help. It’s also more fun, sometimes, for researchers and academians to bicker and tussle over theoretical territory and funding, than to join forces, ask transformational questions, and challenge their own most fondly held beliefs. It’s much easier for us to focus on ourselves, our careers, our reputations, our legacy, than to put that aside for the sake of greater good. And when you’ve built your reputation around one set hypothesis and line of inquiry, the prospect of expanding that in different directions is, well, unappealing to say the least. Plus, the system just doesn’t function that way. You can’t get funded for one experiment, then expect people to welcome you with open arms when \you drop it and run in another direction entirely. And if you collaborate… who will get the credit? Who will share the funding? The system doesn’t help, in these respects. Outside of the system, however, there are plenty of places to develop and grow. Of course, then you run the risk of falling into the company of people who invent their own criteria of success, who concoct their own “standards” and who declare victory by making their own medical rules and playing by them. There’s a fine line between innovation and hackishness, and with the availability of equipment and the relative ease of publishing, with the right money, methods, and marketing, you can invent a whole new field of research and treatment — without the burden of peer reviews or quality controls… all in the name of “innovation” and “groundbreaking discoveries”. Science? Who needs science? I have a license to practice, my own corporation, a lawyer, an accountant, equipment, and a website. What do I need with science? But again, I digress. Or perhaps I don’t. Ultimately what it all comes back to is the willingness and ability of the thought leaders in TBI and Trauma research to put their heads together and be able to collaborate rather than compete. The mostly excellent post-traumatic stress book by Rober Scaer, MD, The Body Bears the Burden, which is full of great trauma information, falls squarely into the trap of competing with TBI information to explain away the difficulties that take place after a motor vehicle accident. And that serves no one other than perhaps the author’s ego. In discounting TBI issues, the author misses a truly valuable opportunity to expand on his hypothesis and instead hobbles it. Taking a this-OR-that approach with TBI and PTSD only contributes to the confusion, because it ignores the feedback mechanisms of our entire experience, that exacerbate our difficulties, at the same time opening the door to even more problems because it’s not attacking them head-on. Likewise, my neuropsych has been pointedly reluctant to discuss anything relating to PTSD. They just are not going to go down that line of enquiry. From what I can tell, they are wholly focused on a TBI-centric approach. It’s been profoundly helpful to me, having neurologically based approaches. At the same time my own work with my own post-traumatic stress issues has probably contributed a LOT to my progress and my continued recovery. No, not probably — I know it has. The irony is, my NP occasionally says that they wish their other patients were doing as well as I am, and they openly marvel at the progress I’m making. But will they talk about trauma and post-traumatic stress? Not on your life — perhaps/probably because to venture into that area might overstep their professional expertise. But we HAVE to overstep these bounds. We just have to. TBI feeds PTSD. PTSD makes long-term, unresolved issues with TBI (especially mild TBI) all the more likely. This is the understanding I wish to heaven I could bottle up and distribute to everyone who suffers “for no apparent reason” with ongoing mild TBI/concussion issues, as well as those who intend to help them. When we fail to see how each contributes to each other, we short-circuit our ability to heal and move on. We keep re-traumatizing ourselves… and the more backlog of stress hormones we have in our system, the more it impairs our thinking — and our living. There is just no way around it. But people don’t seem to get the connection.The irony is, we know about the effects of chronic stress on the human system. And we know how to measure this stuff. Once we know what the deal is, developing adequate responses to chronic post-TBI stress would not be rocket science. There are many, many effective, proven ways to deal with stress. We just have to have some sort of scientific basis to get it out in the mainstream. People generally pay closer attention if something is based on research or actual science. But I’m sure it would be a fairly straightforward thing to study. All you’d have to do is have subjects who have sustained TBI agree to live their lives “normally” and gather data about their experiences and their stress levels — have them log their life events and their experiences of those events, and also measure their stress hormone levels at regular points throughout the day. It wouldn’t even need to be particularly invasive or disruptive. I believe you can measure those levels through saliva. You’d just need to have a good process in place, and you’d need to have a way to ensure that your test subjects were keeping to the protocol. Hell, I’d do it myself, but at $80/pop, the idea of testing myself at regular intervals throughout the day over an extended period of time is prohibitive. But it would make an interesting study. Anyway, as I was saying when I started… back in March of 2009, I started writing about how TBI and PTSD are intricately interconnected and form a feedback loop that self-perpetuates over the long term. With the recent research coming out about TBI and PTSD being interconnected, it’s opened the door a bit more to discussion about what exactly that means and what we can do with the information. I am particularly interested in the logistical complications that stem from this interaction — and how the interactions are aggravated by the logistics of just living your life after TBI. My own life is a bit of a laboratory in this respect; fortunately or unfortunately, I’m not under the microscope of an outside independent party who can quantify the data and publish the results. But at least I can do what I can do. I have resolved to continue writing about this subject in greater detail, just in case folks on the science side happen to stop by and pay a visit. Who knows? We may all end up talking to each other eventually. And we might actually figure out some solutions to these problems which affect — in a very real and daily way — ALL of us. Huge problem! I believe the solution will be in the hands of the injured. They are the people who hold the key to this. Research is limited and the brain is unique and complex. Many with TBI can’t function at all, so how are they to get accurate data from these poor souls? It’s hard enough for those functioning at a higher level, because it’s the disbelief that professionals don’t take their symptoms seriously. Unfortunately we have all these children suffering repeated blows to the head…and we keep raising that red flag to stop and listen! Take care of these children, and other suffering injuries of all degrees. Don’t let them follow the journey we’ve been down…treat them and care for them. Thanks for writing another great post! When we address all these as parts of the whole, hope comes into view. I agree! You have listed many of the symptoms shared by most TBI sufferers. If they are not symptoms currently, it only takes one more injury… before these symptoms become apparent. We know, we’ve been there! When TBI is addressed and treated, only then will those sufferers be treated for all the other symptoms they endure. I want to donate my brain to help with this research. Any idea where and how to go about this?